Demonstrating Sweet Taste | Sweet Deal's Blog! Laos is a lovely landlocked country in southeast Asia bordered by Thailand to the west. Two of these countries’ best exports teamed up to sponsor a fantastic demonstration, with Sweet Deal brand ambassadors serving as liaisons of Laos. As spring continues to tease us with the promise of sunshine, flowers, and an eventual glorious summer, Sweet Deal brand ambassadors come to the rescue by wetting your whistle with a free sample of tropical beer that has traveled all the way from the eastern hemisphere. At the acclaimed restaurant, Pongsri Thai, in the Chelsea neighborhood of Manhattan, customers were given the opportunity to discover (or in some cases, rediscover) a great lager to add to their list of good libations. 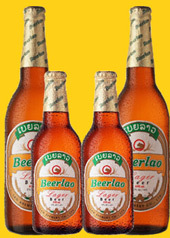 As friends and family sat down to a delicious meal, they were extremely pleased to be offered samples of Beerlao, the national beer of Laos. The Sweet Deal brand ambassadors operating the demonstration know how to make the most of a sweet sample. They poured the delicious tropical lager into the center of the cup so the customer could enjoy the flavor of jasmine rice enhanced by creating a nice head in the beer, and guided them through the experience by asking them to stop and appreciate the fragrance and unusually light taste. Not only did these lucky diners get free beer, but they went home with Beerlao stickers, pins, and information as well. There are intricacies to promoting a brand that may be new to a certain consumer base. Tasters must not only like the product, but they must also remember to keep it at the top of their grocery lists and know exactly where to get it. Our brand ambassadors for Beerlao had a jolly time with the customers, listening to stories about one diner’s time spent living in Laos, while also delivering all the pertinent information about the product. Our brand ambassadors take time to chat and exchange stories with the people they demonstrate to, intertwining the experience with the product into the warm, friendly conversations about 14th century castles and beautiful rainy seasons in Laos. In the aftermath of St. Patrick’s Day, beer aficionados may be interested in a sweet, unassuming lager that packs all the alcohol content with less of the bulk. If it is company and conversation you are interested in, contact Sweet Deal to put a personal touch on your brand. This entry was posted on March 25, 2011 at 2:46 pm and is filed under Demo, Uncategorized. You can follow any responses to this entry through the RSS 2.0 feed. You can leave a response, or trackback from your own site.